Check out our recent installs we did in Queen Creek Arizona! 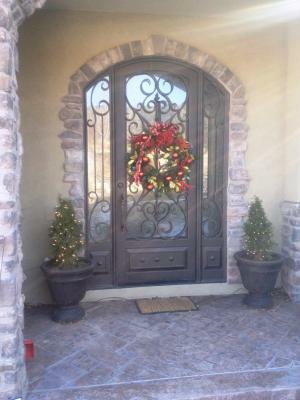 One family selected our Sedona style door to complement their home with its side lights and transom. The rain glass (dual paned and tempered) added a nice classy touch. 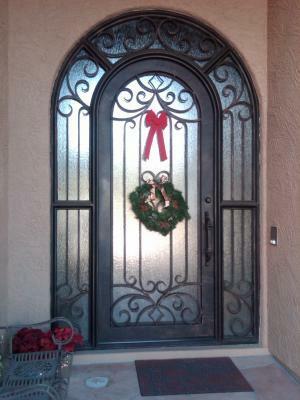 The other family selected our Milan door with sidelights. Each of our designs come in a variety of options, so no matter your needs or preferences, we will meet them. Our main office is located off of Southern and 40th st in Phoenix Arizona. With a full staff of iron welders and designers, our team hand forges all our products with our managers involved in every step. Call us and come by our showroom to find out what iron door options will complement your home best.